This event is free and open to the public. Rain date is set for Sunday, April 14. Hop on down to East Passyunk Avenue for a day of ‘egg-citing’ Easter festivities! Tomorrow, East Passyunk Avenue Business Improvement District (EPABID) presents the Annual East Passyunk Easter Egg Hunt from 11 a.m. to 2 p.m. on the lawn of the South Philadelphia Older Adult Center, located at 1430 East Passyunk. Children are invited to decorate egg collecting bags, enjoy treats, dance to family-friendly tunes, hunt for prize-filled eggs and meet the Easter Bunny. 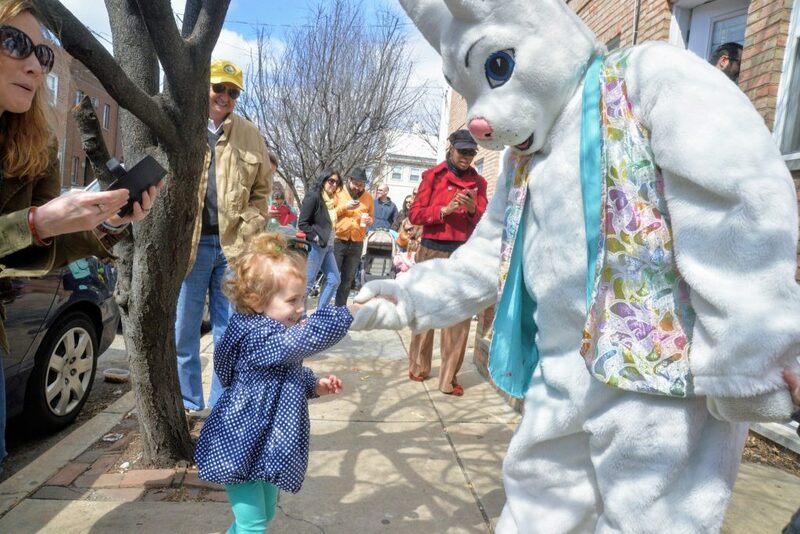 Egg Hunt times are staggered by age group: four-years-old and younger at 11 a.m., 5 to 7-year-olds at noon and 8 to 10-year-olds at 1 p.m.
After the festivities, families are invited to enjoy kid-friendly brunch and lunch menus at eateries along East Passyunk. Every year, hundreds of children converge on East Passyunk to hunt for eggs that are filled with candy and treats, plus golden-ticket certificates valid for businesses along East Passyunk, such as Bing Bing Dim Sum, Essen Bakery, Favors and Flavors, Occasionette, P’unk Burger, Redcrest Fried Chicken, Roly Cow, Tildies’ Toy Box and Vanilya Bakery. BEN FM will play tunes to dance into spring! The Easter Bunny will pay East Passyunk a special visit and pose for pictures using your camera. Children are invited to decorate egg collecting bags. After your little tykes work up an appetite, bring them out the Avenue for a delicious brunch or lunch at family-friendly spots like Black & Brew, Cantina los Caballitos, Chhaya Café, La Scalas Birra, Pistolas del Sur, P’unk Burger and others. For weather updates and information, visit @eastpassyunk on Instagram and Facebook or @epassyunkave on Twitter. For additional information, visit www.visiteastpassyunk.com or call (215) 336-1455.